After a man finds himself shipwrecked on a tropical island inhabited by turtles, crabs and birds, he has to find a way to survive. Through his story, The Red Turtle recounts the milestones in the life of a human being. The first thing you notice when watching Michael Dudok de Wit’s The Red Turtle is not animation but sound. Waves crash and the wind howls as a monstrous storm takes hold. Sound - both natural and man made - transports you, along with the film’s shipwrecked man, onto a deserted tropical island. It is only after his arrival in this idyllic, yet dangerous place that we can start to appreciate The Red Turtle’s stunning animation. Light and shadow play across every scene as the film’s colour palette moves from dazzling sun soaked hues to the isolating inky greys of night. Dudok de Wit is renowned for his minimalism and this blends beautifully with the unmistakable visual style of Studio Ghibli. The combination is truly magical. The tropical island in The Red Turtle is no holiday destination paradise. The man has to contend with all of nature’s elements from enormous storms to tiny insects. There is much gripping drama to be found both in his initial battle for survival and in his many attempts to escape. However, time and again, he is foiled by a mystical and majestic red turtle. Frustrated by this inscrutable beast, the man does something he later comes to regret. This action brings him into contact with an enigmatic woman - changing his life forever. It is this meeting that makes us understand the purpose of Dudok de Wit’s tale. This is far from your standard shipwreck survival story. For The Red Turtle has deeper universal matters to explore - themes concerning man’s relationship with nature and the circle of life. Dudok de Wit depicts the stages of the man’s existence and reflects this journey in the animals surrounding him. His film portrays a life that is beautiful and cruel, joyous and heartbreaking. Life begins and ends, there is mystery and understanding. It was only when the film reached its final act that I realised just how invested I was in its characters and story. The Red Turtle prompted an unexpected (and long-lasting) emotional response. I was moved to tears by this beautiful and deeply poignant story - a true masterpiece of animated storytelling. While you may have to seek it out, it is well worth watching The Red Turtle in a cinema - both for the spectacular animation and also for the film’s incredible sound. Both animation and sound have to work particularly hard in The Red Turtle as, in this largely dialogue-free film, they are almost solely responsible for telling the story. Composer Laurent Perez Del Mar worked closely with sound editor, Sébastien Marquilly, and dubbing mixer, Fabien Devillers. The result is a powerful and moving soundscape and score. In 2006, after watching Father and Daughter, the Studio Ghibli approached the director and asked him if he would like to work with them on a feature film. 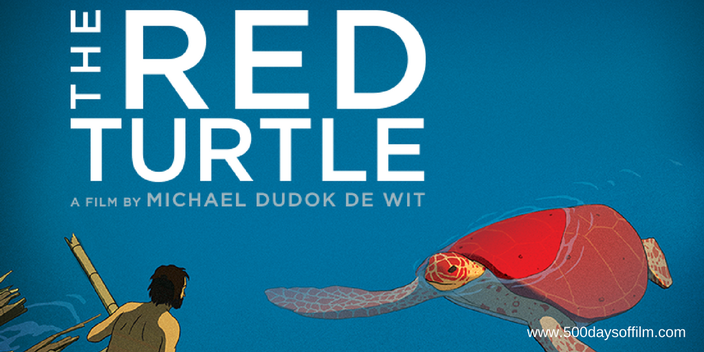 Have you seen The Red Turtle? If you have, what do you think of this animated film? Let me know in the comments section below or via Twitter or Facebook!